Refreshing watermelon and mint complement salty feta in this sweet and savory pairing, that’s a perfect easy, healthy, and flavorful appetizer for a summer party. In addition to how appropriate this theme is for the season, I also love this theme because I am the queen of small plates. When we go out to dinner, I much prefer to share a bunch of appetizers with the table than order one appetizer and a main for myself. I love trying a little bit of everything and really getting the experience of all the restaurant’s offerings. So too when I host a party at my house, I can’t help but make a buffet full of dishes. It’s a very rare occasion that I make a classic meal of one salad/appetizer, one entree with two side dishes, and one dessert. The spread usually consists of a variety of hors d’oeuvres/appetizers, two or three entree proteins, three or four side dishes, and at least two desserts. Even though I almost always end up with too much food, I just can’t help myself! (And I love leftovers of most dishes, so I don’t mind having extra for the next couple of days!). One problem with making so many different dishes is that it’s super time consuming so I end up spending hours – who am I kidding? Days! – in the kitchen leading up to my company arriving and then I am often in the kitchen during the party as well. While I truly love cooking and culinary creativity, it’s nice to have some quick and easy recipes to put out for a crowd so that I can enjoy the fruits (and vegetables, lol!) of my labor with my guests. I’ve shared some easier small bite dishes on the blog, like these Lemon Hummus Endive Boats with Pomegranate Seeds, Fresh Salmon Ceviche with Cucumbers and Radishes, and Watermelon & Lemon Mint Ricotta Stacks, and today I have another one for you! These Watermelon, Feta, and Mint Skewers are so easy to put together and can be assembled at least an hour before company arrives so that it’s one less thing to do in the final countdown to the doorbell ringing. Plus, they don’t really require a recipe. As you’ll see below, I don’t have specific measurements for any of the ingredients because you can make as many or as few as you want/need for your company (although I highly recommend you make more because they’ll go fast!). Most of all, these skewers are packed with flavor in just a few bites and they’re super refreshing for the hot summer days ahead. The drizzle of aged balsamic vinegar adds that final touch of elegance that takes them over the top and will wow your guests into thinking you were slaving away all day in the kitchen! So get ready for all the summer celebrations and enjoy these nutritious and delicious, quick and easy, flavor-packed small bites! 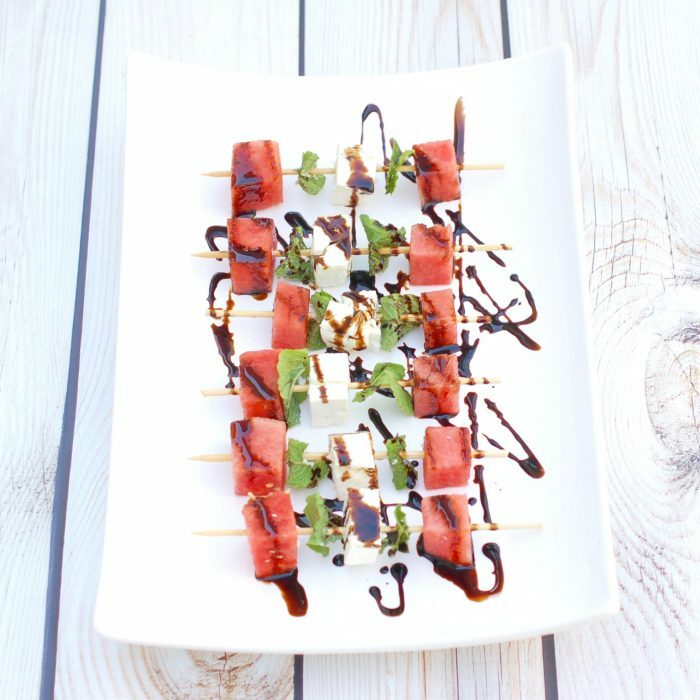 Watermelon Feta and Mint Skewers are the perfect easy, healthy, and flavorful appetizer for a summer party. 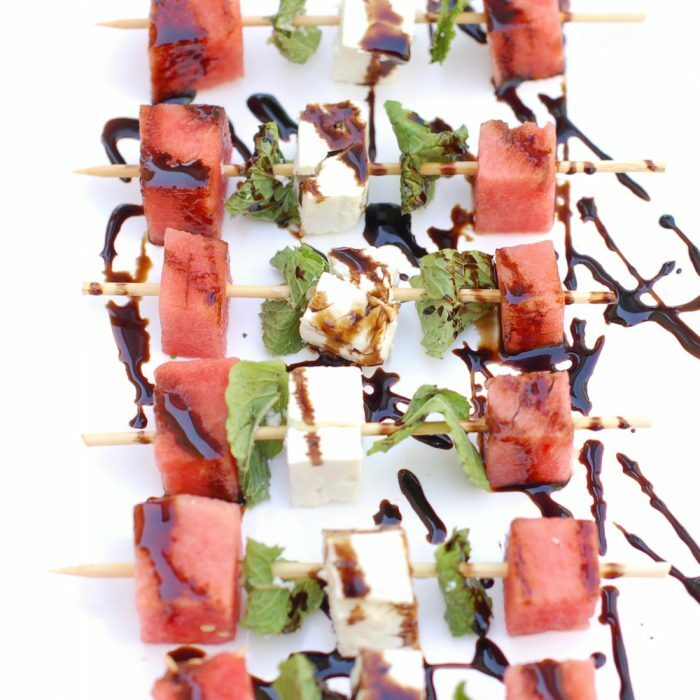 Refreshing watermelon and mint complement salty feta in this sweet and savory pairing, finished off with a drizzle of decadent aged balsamic vinegar. Thread a piece of watermelon onto a skewer, followed by a mint leaf, a cube of feta, another mint leaf, and another piece of watermelon. Repeat with the remaining ingredients. Store covered in the refrigerator for up 1 hour, if desired. Just before serving, drizzle each skewer with aged balsamic vinegar and serve. The amount of each ingredient is not specified here because you can make as many or as few as you want. I suggest making a lot though - these are a crowd pleaser! Do you like tapas-style dining? What’s your favorite small plate to make for guests? These look lovely! 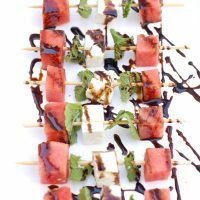 I love watermelon and feta salad so this is like one of my favourite salads but on a stick! Thank you Corina! It’s one of my fave salads too and I can never get enough of it! Thank you Leslyn! Hope you love it as much as I do! Thanks Farrah! Tapas do really add up at a lot of restaurants. Much more cost effective to do them at home!! What a cool idea! I’ve done this as a salad in a bowl… but the skewers are just perfect for summer parties. Thanks Laura! I love it as a salad too and it’s a fun twist for parties! Love these Jessica! We are having a Memorial Day party-must make!! Thanks my friend! Hope you have a great party and everyone enjoys! These are so pretty! I’ve never tried the watermelon-feta combo but I see it paired all the time. Time to step out of my watermelon comfort zone! Thanks so much Anne! You have to try it – it’s such a fabulous combo, especially if you love sweet and savory together! Love the simplicity, super pretty too! Thank you Bridget! Sometimes the simplest recipes are the best! Those look amazing, and I love how simple they would be to make! Perfect for summer! Thanks Melanie! Definitely super easy! Hope you try them! Looks delicious! This is one of my favorite summer salads, love that you made it into kebobs! Thanks Alex! It’s one of my fave salads too – can never get enough of it! Thank you! That sounds delish with jalapenos! Yum! Watermelon and feta is such a wonderful combo! Nothing like that sweet and salty. This is definitely going to be on my summer menu!! Thanks Alanna! Once you make it I am sure it will become a staple summer snack or app! Have a great holiday weekend! Yes Emily, it’s so summery and delicious! Hope you try it. Thanks for stopping by!